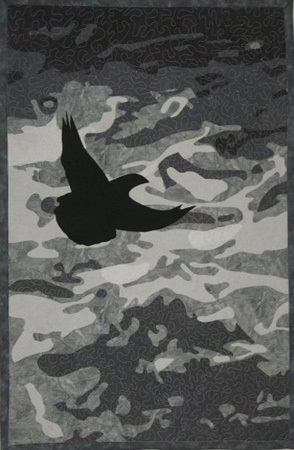 The River, quilt, 44" x 22"
Iowa Artisans Gallery hosts 13 Ways of Looking at a Blackbird, based on a poem of the same name by Wallace Stevens. The exhibit includes thirteen art quilts by eleven members of the Fiber Artists Coalition and runs April 22 - May 29, 2011. The Fiber Artists Coalition is made up of Professional Artist Members of Studio Art Quilt Associates (SAQA) from the upper Midwest. SAQA is a non-profit organization whose mission is to promote the art quilt through education, exhibitions, professional development and documentation. Visit the Studio Art Quilt Associates' website. Learn more about the Fiber Artists Coalition and visit its blog.